We supply oil coolers for use in many applications both industrial and automotive. However, these pages are aimed at the automotive application. Why do we need an engine oil cooler? Increase in rpm; the oil cooling requirement of an engine will increase up to threefold for an increase of 1000rpm, making this the most common cause of engine oil overheating. German specification cars are always designed with extra oil cooling because of possible high speed running on unrestricted autobahns. On the track the almost constant use of high rpm makes an oil cooler mandatory, even in an unmodified engine. Obstruction of airflow to the sump; caused by fitting sump guards, spoilers etc. Oil circulation through a turbo charger not only lubricates but also removes a large amount of heat which will add to the overall cooling requirement. Increasing the power output of the engine will increase combustion temperatures but, except in the cases where oil is used to cool the piston crowns, most of the excess heat will be taken away by the water coolant system. Is overheated oil a problem? Oil as it gets hotter becomes thinner (less viscous), losing its film strength, this film strength supported by oil pressure is what keeps bearing surfaces from touching, once bearing surfaces touch, metal is removed, clearances widen, oil pressure drops, the contact surfaces are further worn away and immediate engine failure takes place. It is also worth considering that, in the modern engine, oil is used as a coolant of pistons crowns, if the top of the piston becomes too hot detonation takes place causing loss of power or even piston/gasket failure. Some oils are advertised as being able to cope with higher temperatures, this is easily achieved by supplying a more viscous oil that will have greater film strength for a given temperature, the down side is that at lower temperatures there will be higher friction/pumping losses. The oils recommended for everyday motoring will have a viscosity sufficient to cope with the warmest extremes of expected motoring conditions, by fitting an oil cooler and oilstat a very low viscosity oil, giving increased power and decreased fuel consumption during relaxed motoring can be used. It will be appreciated from the foregoing that there is no optimum engine oil temperature, modern oils will not be damaged by high temperatures although some may leave varnish deposits which can block oil ways. Every engine will have a different oil temperature requirement but, as a general rule temperatures in excess of 110°C should be avoided. Why do we need transmission coolers? 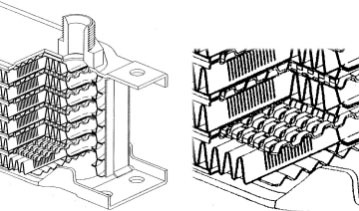 Oil coolers are used for cooling gearboxes, crown wheel and pinion units, differentials and power steering pumps where the primary problem is not so much concerned with avoiding metal to metal contact but in preventing loss of tolerances due to heat expansion of metals which in turn lead to greater friction resulting in a runaway spiral of heat build up. In road usage the only problems experienced are with automatic transmissions when vehicles are used for towing, many vehicles have some form of oil cooling but this is usually inadequate, extra cooling should always be provided because even if actual breakdown does not occur, higher temperatures shorten the life of seals which can be as expensive to replace as an entire gearbox. Race track usage leads to higher temperatures due to higher power loads and increased activity in gear changing, wheelspin and steering wheel twirling. What kind of oil coolers are there? The most popular oil to air coolers are the pressed or stacked plate range of coolers which were first made in the late 50’s, These coolers built to our specification since 1965 must rate as the single most commonly used component on racing cars world wide. The cooler consists of a variable number of aluminium pressed plates forming oil ways and end tanks, the oil ways contain turbulators which not only break down boundary layer effect in the flow to obtain maximum heat dissipation without undue pressure drop but also because they are brazed to both surfaces of the plates hold them together under pressure. The oil ways are interspersed with aluminium strip louvered and formed into corrugations to provide airways. The design is beautifully simple and efficient and most suitable for mass production, but being made from expensive press tooling it is restricted in thickness and length but not height. 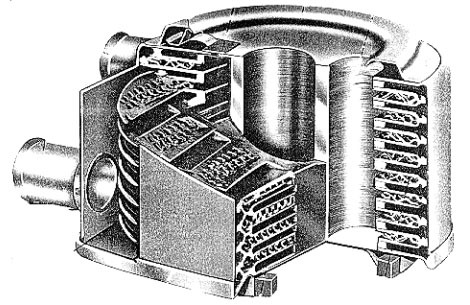 Making a comeback is the tube and fin cooler consisting of a number of preformed flattened tubes surrounding turbulators and separated by corrugated airways, this is a more flexible design allowing infinite lengths, depths can be in multiples of the tube width, however end tanks have to be made separately resulting in a more expensive and heavier assembly. The finned tube type of oil cooler is an anachronism only suitable where space is unlimited. The current money is no object attitude prevailing in the top echelons of motor racing has resulted in a couple of aerospace heat exchanger manufacturers becoming interested in supplying their plate and bar coolers to the racing car industry. They are fabricated from strip, and can be made to the exact size to suit the customers packaging requirements. Until the last 5 years the oil to water cooler or fluid to fluid cooler has been more of a rarity in automobile usage. The most common the tube and fin in a shell type cooler, popular in marine usage is too heavy and cumbersome. Up to recently the ubiquitous pressed plate type of oil to air cooler but in a fabricated water jacket has been the answer, now the amazing Laminova laminar flow cooler has opened the automotive market to oil to water coolers. The main components are two aluminium extrusions, one forming the outer shell, the other the core which by some magical process has been machined to provide fins 0.2 mm ( 7 thou) thick and 3mm high and spaced 0.3mm (11 thou) apart through which the oil flows, such restrictive finning would normally cause a huge pressure drop, but by introducing channels in the finning, the oil flow is kept laminar as opposed to turbulent as in other cooler designs and the pressure drop remains low. The water flows through extruded channels in the outer core, removable plugs/restrictors control water pressure drop This construction is pretty versatile the shell and core being made in 4 different diameters with, in theory, infinitely variable lengths. For very compact installations, cores may be slotted into each other. The secret to obtaining the best performance is to tailor the removeable plugs to obtain the best oil temperature drop without compromising the water temperature. The donut cooler has a variable number of pressed plates forming oil and water ways, the oil ways containing turbulators. A pressure relief valve is incorporated to allow oil to bypass the oil ways during cold starts, excessive oil flows or blockage. Pressure drops through this type of cooler are high. Which are the best oil coolers? All the coolers discussed here, except the finned tube and the Laminova are as efficient as each other in so far as greater heat rejection can only be obtained at the expense of oil pressure drop or air pressure drop, On the oil side the performance is controlled by the design of the turbulators, if you increase the amount of turbulence and make the oil follow a more tortuous path so as to bring it into greater contact with the cooling surface area to obtain greater heat dissipation you will increase the oil pressure drop, often the very problem you are fitting an oil cooler to avoid. On the air side if you increase the pitch of the corrugations or increase the depth (front to back measurement) you will increase the air pressure drop, thus requiring higher vehicle speed or sophisticated ducting to obtain better results. The fluid to fluid cooler becomes viable when packaging constraints do not allow for mounting a cooler in the airstream and where there is enough thermal capacity in the water radiator to cope with the extra loads, because engine coolant warms more quickly than the oil, the oil warm up is quicker which can show benefits in engine wear and economy. The Laminova cooler is able to achieve a high degree of efficiency within a slim envelope because the unique finning provides an enormous cooling surface area in contact with the oil Although not as cost effective as the pressed plate cooler, there are bonuses in that it is very strong and unlikely to be damaged in any but the biggest crash and it may be stripped for cleaning purposes, invaluable after an engine blow up. 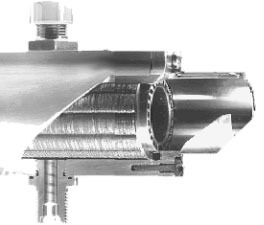 The donut cooler is designed for ease of installation, fitting between filter head and filter and using a bypass water flow (in a similar fashion to a car heater) , as it cannot use the full water flow performance cannot match the Laminova, it is made of stainless steel thus incurring a weight penalty compared to all others. The bar and plate coolers are not, in their construction, any more efficient than the pressed plate, tube type or Laminova coolers, their value lies in their being able to be made to exactly match the vehicle requirements where all relevant parameters, oil flow, air flow, temperatures, acceptable oil pressure drop, and air pressure at varying speeds are known. These hand made coolers are priced in thousands of pounds. We think that the design of the pressed plate cooler is the best compromise to cover all types of motoring and motor sport, irrespective of price, the best of the competitors offer very similar performance because their design closely follows our product. However there are now a number of Chinese made copies on the market which due to lack of investment in proper tooling are heavier but worse are inadequately brazed resulting in early failure when subjected to pressure cycling tests. Unless a cooler has genuine Mocal, Setrab or PWR labels we suggest you avoid. In the literature of one of the many sellers they claim "these coolers have been developed from years of practical experience in the Motorsport field".We very much doubt that anyone in the Chinese factories has ever heard of a racing car much less have ever seen one. Heat dissipated is not necessarily the sole reason for choosing a cooler, A larger cooler may be chosen to avoid excessive oil pressure drop, be aware that the more rows/tubes and the shorter their length the smaller will be the pressure drop or in the case of the Laminova the longer the cooler the smaller the oil pressure drop although the water pressure drop is greater. In the case of the air to oil cooler, The oil cooler will only achieve results where a volume of air is passing through the fins. The amount of heat dissipated by radiation is negligible. In practice the most convenient position for the oil cooler is in front of the water radiator where a flow of air is guaranteed. Even in cases where the water cooling is marginal, placing the cooler in this position will have hardly any effect on water temperature. The sheer volume of air passing through the cooler ensures that the air is only heated a few degrees; not enough to affect the water radiator performance, and as the oil cooler is a more efficient device for extracting heat from the engine, the overall effect is helpful. However, where water cooling is marginal it is essential that the oil cooler be placed against the water radiator face, otherwise warmer air leaving the oil cooler will become turbulent on meeting air at ambient temperatures and will not pass through the water radiator. If placing of cooler and water radiator in close proximity is not possible then a duct of thin aluminium should be made to exclude the ambient air. If space is not available in front of the water radiator due to an electrical fan for instance, the cooler may be mounted behind the radiator and will still work well for the reasons already given. In the unlikely event of an insufficient space being available either behind or in front of the water radiator, the radiator grille may be moved forward by using longer screws and spacers. Alternatively oil cooler size holes may be cut in the forward bulkhead either side of the water radiator and air from the grille ducted to the cooler. Mounting on bottom brackets alone will suffice up to 13 row coolers after that all 4 brackets should be used, a system of spacers and long bolts tying in all four brackets will spread the load. The cooler will expand with heat so allowing someflexibility in the mountings will prolong cooler life The weakest part of the plate type cooler is the brackets, breakage of which often damage the whole cooler. if fitted to any vehicle that may be subject to vibration or twisting of the mounting platform, consideration should be given to abandoning the brackets and mounting in a cradle, locating with cable ties or an elastic strap should be sufficient as the hose will provide some restraint. Oil coolers may be mounted anyway up and are self bleeding, the resistance to oil flow through the matrix means that tanks will fill up evenly pushing out the air before the oil flows through. For packaging reasons it may be necessary to use two coolers, if possible connect in series although this will double the pressure drop, If parallel connections are made, unless the oil pressure drop through each is equal oil will take the line of least resistance and pass through only one, therefore pipe lengths and air flow at all times must be matched for the system to work. Two coolers in parallel will halve the pressure drop. If a Laminova oil to water cooler is used, the whole engine water flow should pass through the unit for maximum cooling effect but if this is not possible a partial flow may be obtained by teeing off and running in parallel with water radiator/heater matrix. We can supply a plug or restrictor to divert more water flow through the annular water ducts of the core, this will restrict the overall flow of water and may cause problems with the main cooling system and is more likely to be beneficial in partial flow installations, we suggest experimenting with restrictors if more oil cooling is required. Please ask for rebuild instructions. The Donut oil cooler can only be fitted to engines with spin on type oil filters. The starting point is to identify a point from which the oil supply may be interrupted and diverted through an oil cooler, in most cases this will be a full flow oil filter, some cars, e.g. BMC A series, MG B have an external pipe leading to the oil filter, replacing this pipe with flexible hoses to and from the cooler is an easier alternative. If we decide on using the filter, we have further choices, either to place an oil cooler take off (sandwich plate) between filter head and cartridge/bowl, or if more convenient between filter head and block. In either of these cases if room is limited (a sandwich plate adds about 1 3/8" / 34mm) a smaller filter, changed more frequently, should be considered or fit a remote filter take off plate in place of filter and run hoses to a remote filter head in a convenient place. When working out such installations it is important to remember that oil flows through the filter from the outside to the centre, hence the outer hole on the take off plate will be the output from the pump. It is preferable to filter hot oil so install with a cooler fitted in the return from remote filter to engine. We sometimes use a new filter head assembly with built in cooler take offs, e.g. Jaguar models. For the Rover, Buick, Oldsmobile, V8 where space can be very limited we can supply a replacement oil pump cover with outlets for a remote filter plus oil cooler if required. The Triumph Dolomite and Stag have a cover plate on the block which may be removed and replaced with a special take off. It is standard practice to put an oil cooler in the return line from the sump to tank. The reasoning behind this would seem to be that as the tank is open to atmosphere, there is no pressure on the cooler and in the event of cooler damage the consequent leak would not be as great as on a pressure line. However there is never a pressure release valve on the suction part of a dry sump pump and in a cold start situation the oil backing up through the cooler can cause pressures high enough to blow up all types of cooler. Also oil on the return to the tank will be in an aerated condition which is thermally less efficient to cool. Serious consideration should be given to fitting the cooler in the pressure line, after the oil filter. Most modern automatic transmissions tap into the return from torque converter to sump, where very little pressure exists, to obtain a full flow of oil through an oil cooler tube in the water radiator, a secondary cooler may be connected in series by interrupting this flow cutting one of the oil pipes leading to the water radiator and securing hoses to the severed ends using hose menders . Where water overheating is a problem in arduous conditions or where the primary cooler has failed the water radiator may be bypassed by connecting directly to the Mocal cooler by cutting both hoses, the hoses to the primary cooler may be taped up to avoid the ingress of dirt if the system is to be reinstated. Old Borg Warner gearboxes are provided with means of tapping the oil flow either by a loop pipe or two plugs on the right hand side of the gear box just above the sump. Renault gearboxes have two plugs adjacent to the left hand drive shaft. Only ZF boxes with an existing cooler can have additional cooling. Some gearboxes and all power steering pumps have an oil pressure system that can be tapped for oil flow otherwise a remote pump is required, we offer two types. We have also supplied the Holley fuel pump, for this purpose with satisfactory results. When designing an installation these pumps require a switch either built in or manual as pumping cold oil is not recommended. Add extra oil to fill cooler, pump and pipes which must be at or below the normal oil level otherwise the oil level in the gear housing will be too high when the pump is switched off. When returning oil onto the gears do so after the point of contact to avoid pumping losses caused by cool oil. If difficulty is experienced in supplying ram air to an oil to air cooler we can supply a fan and housing. Use -6 (3/8" bore) hose. Prolonged use of a car engine in conditions where the oil cannot reach its correct working temperature will cause sludge formation and crankcase oil dilution, leading to excessive wear especially in the cylinder bores. Optimum engine power will only be delivered at correct temperatures. The elimination of drag in engines caused by cold oil is a most important consideration, especially with a racing engine, revving the engine without a load will not put much heat into the oil and devices for preheating the oil may not be available. Control of the oil flow through the cooler can be controlled in two ways. Using a thermostatic device that we call an oilstat set to divert oil to the cooler at 80°C (although a wide range of settings is available for special applications). This is the minimum temperature required to evaporate and dispel contaminating substances. The Mocal oilstats are built into the oil cooler take off or available as a separate unit to be fitted into the oil lines. Some economy can be gained by fitting a high temperature oilstat to an automatic transmission. Temperatures on racing boxes may be too high for an oilstat (140°C max). We offer switches that can be fitted to our adapters to operate warning lights. All engines have a tapping on an oil gallery to take a no oil pressure warning transmitter, we make a range of T pieces to screw into this tapping. Low oil pressure switches are offered as alternatives to the whoops its too late pressure warning transmitters fitted as original equipment, ours provide a warning when the oil pressure drops below the desired running pressure, they can irritate by actuating a warning when the engine is ticking over but are absolutely essential for spotting signs of trouble in a competition engine. Oil temperature sensing is a necessary tool to use in decisions about oil cooling. We can assist in many ways. The first decision is to establish what temperature you need to know, is it a) The maximum oil temperature i.e. the oil in the sump or b) if a cooling device is fitted the temperature of the oil going to the bearings (the first bearing not the last in line) or gears. If you require a) fit the sensor in the sump, in the oil line going to the cooler, in a remote filter installed before the cooler or in an oil cooler take off between filter head and filter. If b) in the return from the cooler or oilstat if fitted. We make adapters to fit in the oil lines, or provision can be made for temperature gauge tapping in oil cooler take offs and remote filter heads. We also provide temperature strips which may be stuck on any clean, dry, smooth surface they will record highest temperature reached but are irreversible, use on oil sumps. tanks, filters, coolers.